Custom Kitchen Cabinets - What are they and can I afford them? So you’re thinking about custom cabinets for your new kitchen...what does the term “custom kitchen cabinets” really mean? To professional kitchen designers it refers to the types and amount of modifications that can be done in a specific cabinet line. Custom cabinets can be built by “hand” in a small shop by master cabinet makers, ordered from a high end manufacturer that offers many modification options, or even bought from a mid-line manufacturer that can change some of the specifications (height, width, depth…) but not as many as the more expensive lines. So, when you think “custom cabinets”, you are probably thinking “expensive”? Am I right? While this can be true, instead you could design your new kitchen so that you utilize mostly stock size cabinets with little or no “box” modifications. By ordering standard cabinets where they make sense, you can save yourself a fair amount of money. You can then “customize” specific cabinets in order to create a beautiful custom cabinet look without having to pay for an entire kitchen full of custom cabinetry. If you plan things right, you can save yourself enough money in your kitchen budget to splurge on items that will give you that custom cabinet look and stay on budget... wainscot on your island, glass doors on some upper cabinets, or even a hutch with furniture feet. 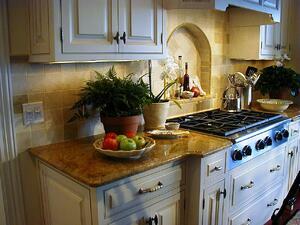 All these details will give you the look of custom cabinets without having to use a custom manufacturer. All it takes is a little research, a good kitchen designer that understands your needs and the patience to work through the details. General Woodcraft, Inc. has an award winning team of kitchen designers in its state of the art newly remodeled Kitchen Design Studio in New London, CT. Click on the link below to contact them today to schedule a FREE one hour Kitchen Design Consultation.